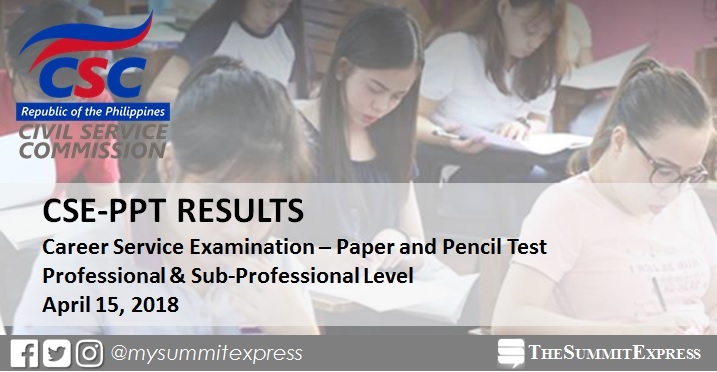 MANILA, Philippines – The Civil Service Commission (CSC) officially announced on Thursday, June 14, the results of the special Civil Service Exam for Professional and Subprofessional levels or CSE-PPT, sixty (60) days after the exam. A total of 1,333 passed the professional level while 610 successfully hurdled the sub-professional level. The examinations, designed for government employees who are not eligible yet but want to apply for permanent position or a promotion, were conducted in Manila and all regional testing centers nationwide. The full list of passers, shall be available on the website of CSC. The agency, in previous posts, said only the list of passers posted on their website is official and has no liability on the incompleteness of posts from other sites. 1. Individual test result using the Online Civil Service Examination Result Generation System (OCSERGS) shall be available by June 29, 2018. 2. Concerns on examination result including verification on Examinee Number should be coordinated directly with the CSC Regional Office concerned. 3. Certification of Eligibility for passers (printed on CSC letterhead, free of charge) shall be issued through the CSC Regional/Field Offices by June 15, 2018. 4. Passers may also opt to apply for regular Certification of Eligibility (printed on security paper at cost). For requirements and procedures, see here. 5. Passers must personally claim their Certification of Eligibility at the CSC Regional/Field Office concerned. Representatives are not allowed to claim on behalf of the passers. a. At least one of the following accepted I.D. cards which must be valid (i.e. not expired) upon claiming of the Certification: Driver's License; Passport; PRC License; SSS I.D. ; GSIS I.D. (UMID); Voter's I.D. ; BIR I.D. (ATM type/TIN card type with picture); PhilHealth I.D. (must contain the holder's name, clear picture, signature and PhilHealth number), Company/Office I.D. ; School I.D. (validated for the current school year/semester/trimester); Police Clearance/Police Clearance Certificate; Postal I.D. ; Barangay I.D. ; or NBI Clearance. Any other ID card not included in the above list shall NOT be accepted. b. Application receipt and/or CSC Official Receipt, if available.